1959 Château Palmer (Margaux). The WOTN. A dark garnet hue with brown edges; the color was the oldest aspect of the wine. Nose was still very much alive. Cherry liqueur, raisin, tobacco, and a hint of barnyard. Complex and layered, this was one wine that seemed to gain momentum throughout the evening. While more concentrated than the GPL, it was still on the lighter side. Structure hanging on. A special wine. 97/100. 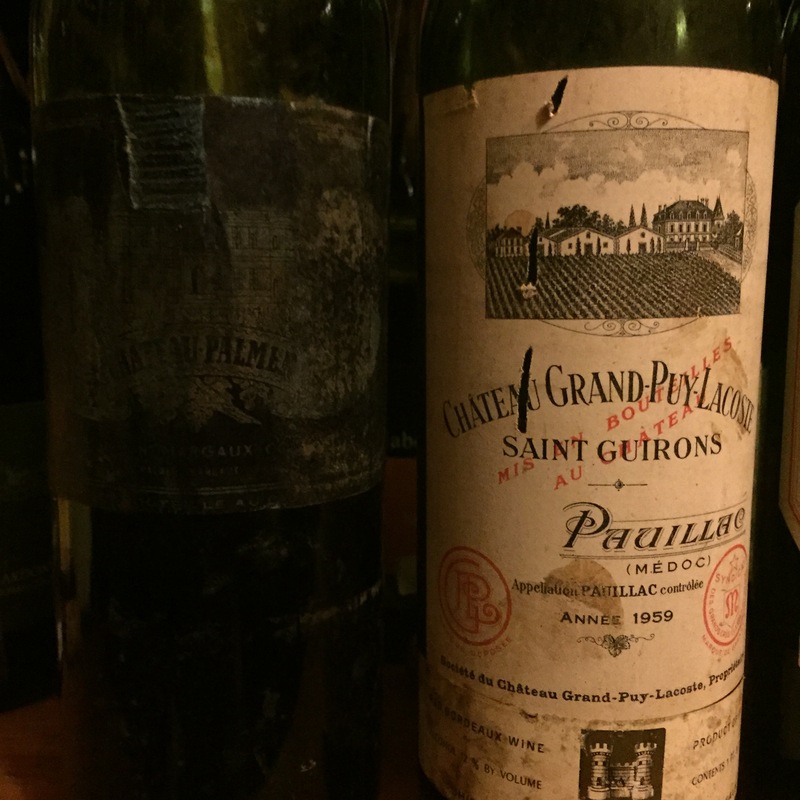 1959 Château Grand Puy Lacoste (Pauillac). Improved throughout the night, but more of an average aged Bordeaux. Similar aromatics, with cherry, fig, raisin, and tobacco. Lacked some weight on the mid-palate and fell a bit flat on the finish. Still an enjoyable wine if you find it. Clearly this round goes to the Palmer. 91/100. 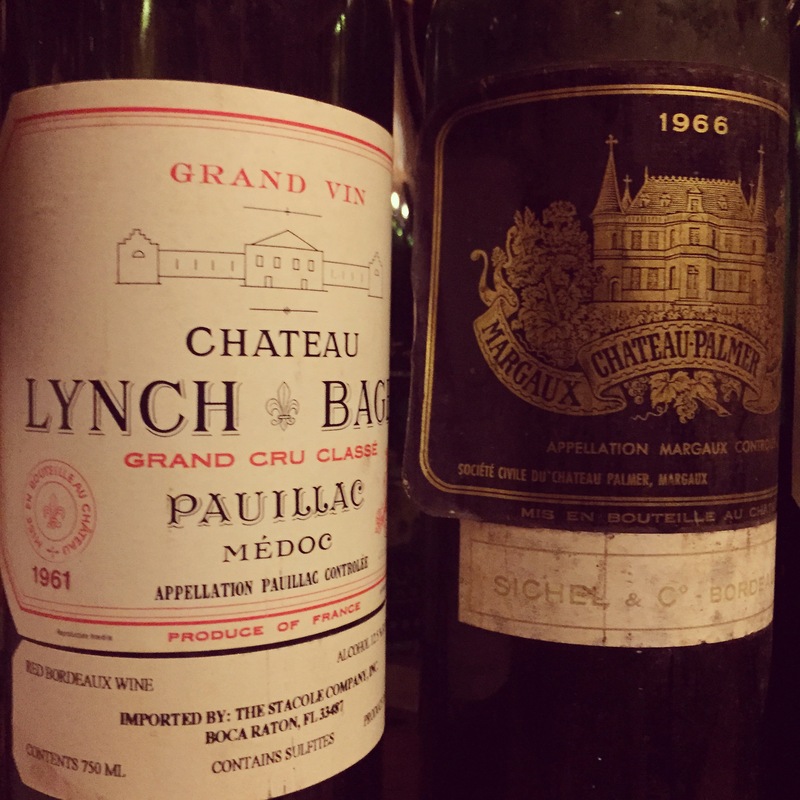 1961 Château Lynch-Bages (Pauillac). Drinking extremely well for a ’61. Still with excellent concentration and deep color. Cassis, black cherry, leather, Asian spices, and cedar. Opened up over two hours and improved significantly in the glass. Still has a solid tannic structure. Only knock would be a bit high acid on the (lengthy) finish. 94/100. 1966 Château Palmer (Margaux). Not a favorite in the room, but I personally considered this the #2 of the night. Dark fruit, smoke, earth, and some beautiful barnyard scent. Exceptional balance. Everything seems in its right place. Extremely smooth on the palate. Long finish. 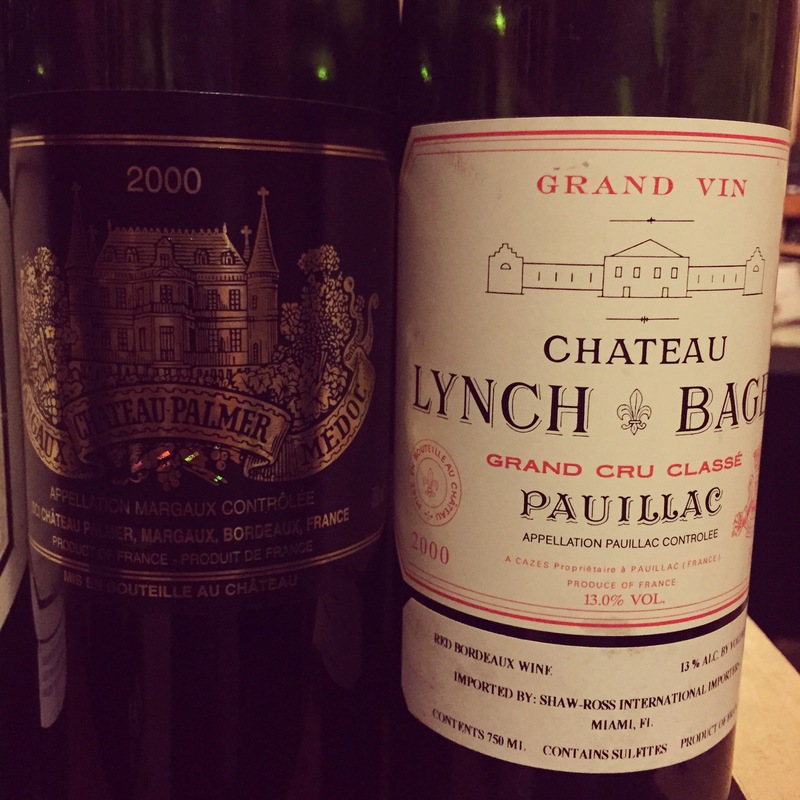 The Palmer edges out the Lynch-Bages in this round. 95/100. 1983 Château Margaux (Margaux). Has that perfume one would expect. Dark and red fruits, spice, and floral notes. Solid mid-palate. Still with prominent tannins. Long finish. Again, a wine with exceptional balance. Its strengths are its complexity and concentration, but not really a stunner. 95/100. 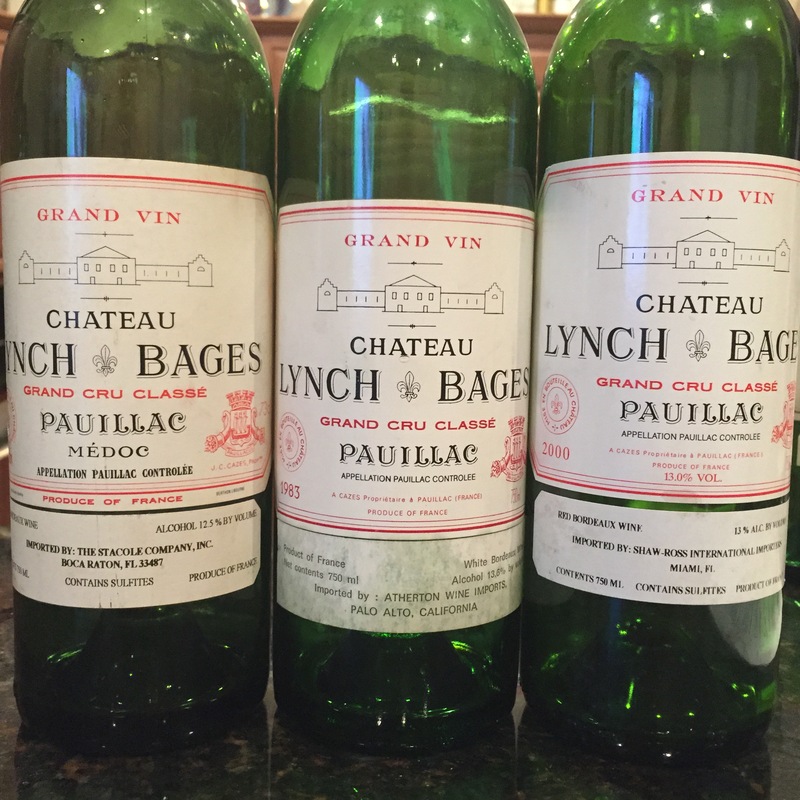 1983 Château Lynch-Bages (Pauillac). The most unique wine of the night. Cassis, licorice, old dusty library book, and urban funk (distinct from a barnyard funk). This strange nose was initially off-putting, but became quite charming. More elegance than power. Still has a bit of grip. No detectable heat on the medium length finish. Acidity a bit out of balance. Definitely better than the 81 point wine scored by RP. 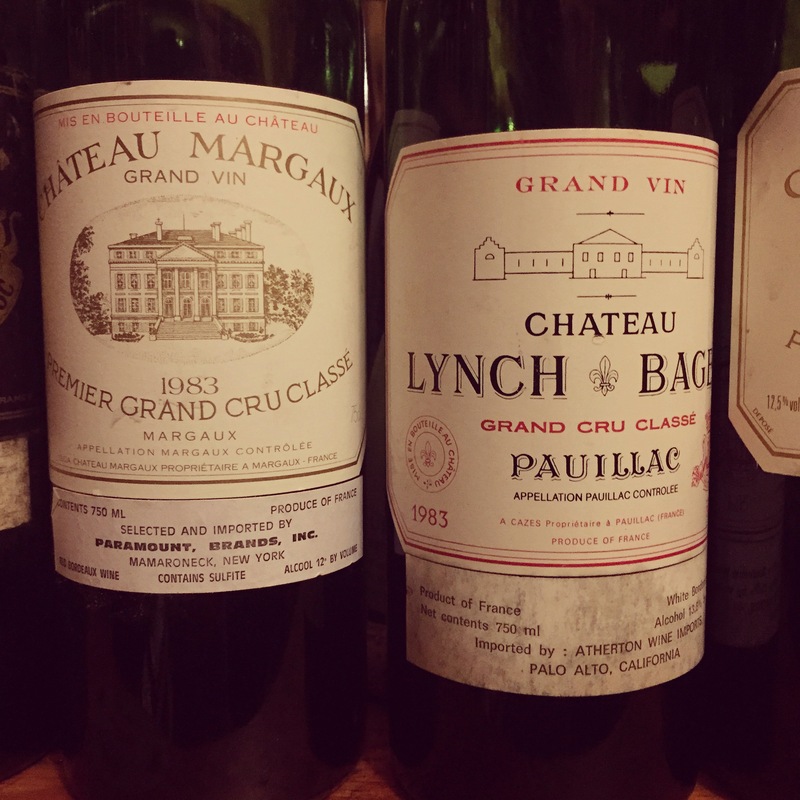 This round goes to the Margaux, but for the value, this Lynch-Bages is something to look at if you don’t mind funkiness. 91/100. 1995 Château Margaux (Margaux). Perhaps the disappointment of the night, considering its pedigree. Shy on the nose, but had a nice mix of dark fruits, spice, and floral. Full-bodied and mouth-filling on the palate. Structured as can be. Very long finish. So why a disappointment? It’s very far from showing its true colors, so it was hard to be too excited about it tonight. 93/100. 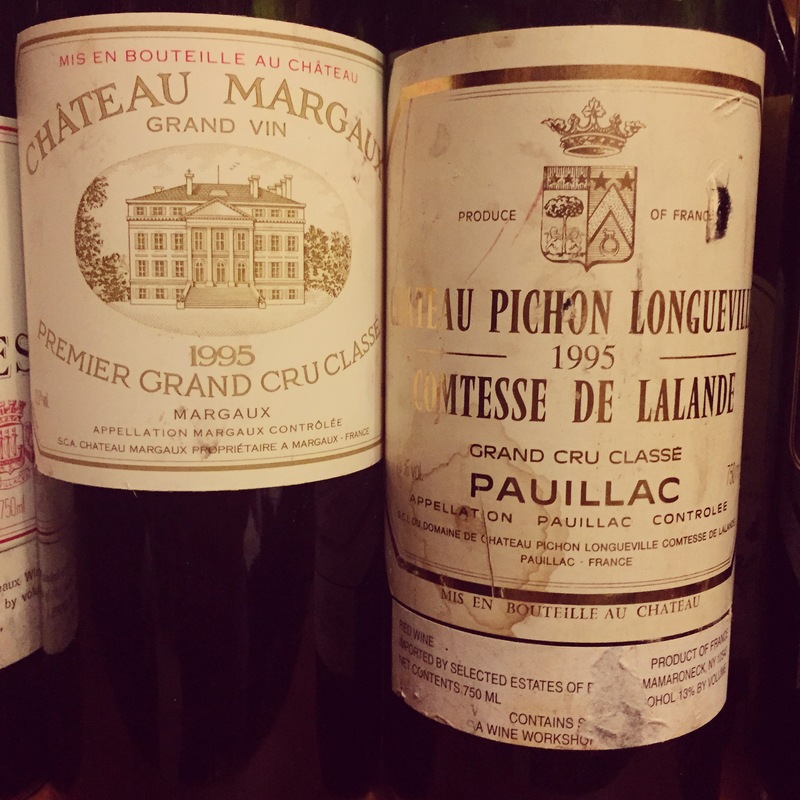 1995 Château Pichon Longueville Comtesse de Lalande (Pauillac). More powerful than the Margaux, with a more open nose. Black currant, cedar, and mint. Lacks the earthiness of typical Pichon Lalandes. 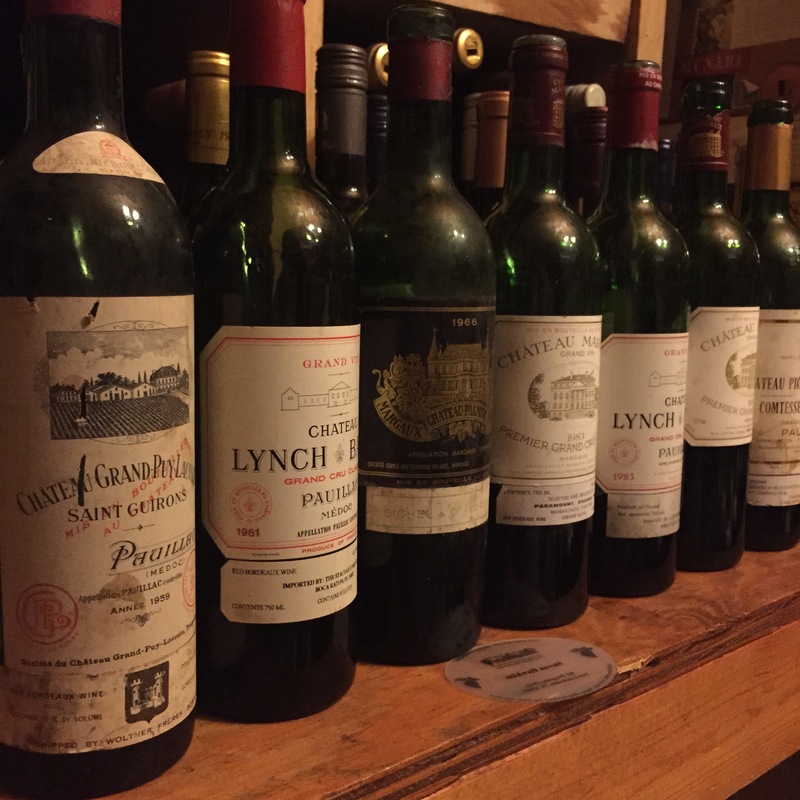 Sampled the ’96 Pichon Lalande last night, and the ’96 is definitely the superior vintage with far more complexity. Better on the nose than palate right now. A little tart on the finish. Still, tonight the Lalande beats the Margaux (though that will change in 10 years). 94/100. 2000 Château Palmer (Margaux). Similar to last bottle enjoyed a few months ago. This is a great Palmer, but like the ’95 Margaux, so far from its potential. Blackberry, raspberry, lots of violets, and mocha. Concentrated and tannic. My first note I wrote was, ‘tons of potential.’ Cellar this baby, and drink your ’83 and ’89 Palmers. 93/100. 2000 Château Lynch-Bages (Pauillac). Simply a great wine. Lots of layers, with cherry, tobacco, pencil shavings, and cigar box. Nice balance of power and elegance. Has serious grip. A fantastic finish. No bitterness and acidity is where it should be. This round goes to the Lynch-Bages. 95/100.